Are you entertaining over Christmas? 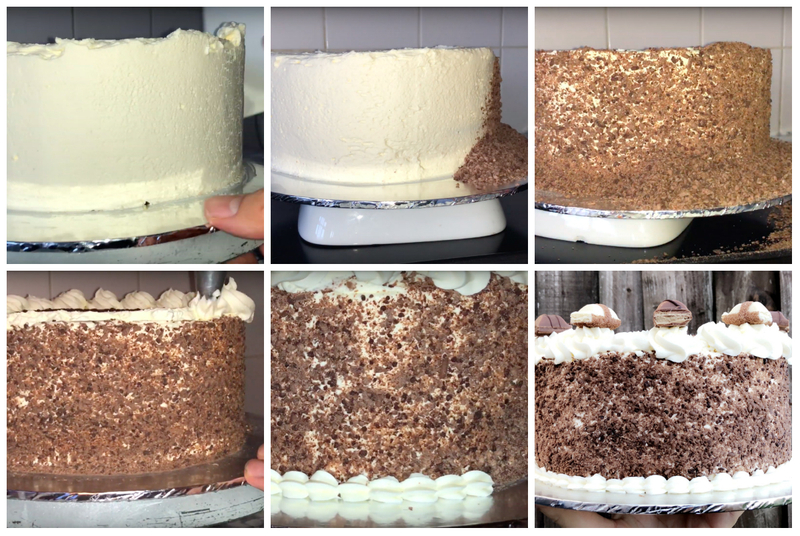 Need a fresh cream cake that’s fully customisable? Don’t worry, I’ve got your back. I thought for today’s recipe, I would share my recipe for the quickest and most customisable fresh cream cake. I use a vanilla cake with sweetened whipped cream and homemade strawberry jam, what’s not to like about that? You could use a chocolate cake or make yourself a black forest gateau (I have a recipe for this here). 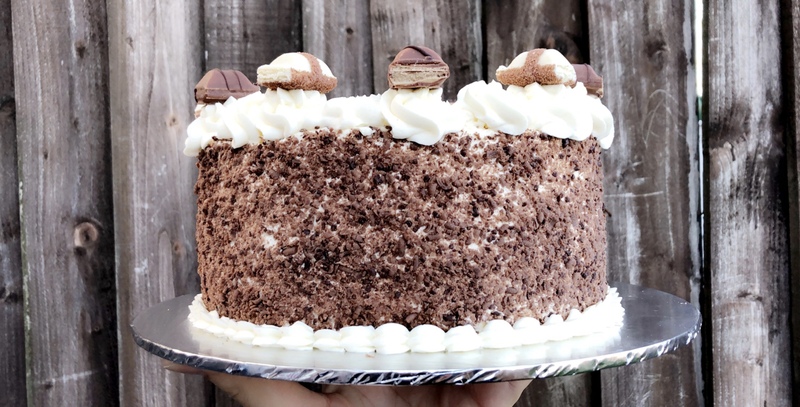 This cake is pretty simple and straightforward to make but when it comes to the filling and decoration, you can fully customise it to suit you or your occasion (using chopped nuts in place of the chocolate or using fresh fruit on top of the cake instead of kinder Bueno, the opportunities are endless). For the cake I used a simple cake recipe, which will yield you two layers of vanilla cake (feel free to double the recipe and make yourself an indulgent treat) which is made using the creaming method, this is where you cream together the butter and sugar, then add the eggs and dry ingredients. So to start the cakes, place your butter and granulated white sugar into your mixing bowl of choice and beat the two together until they are well combined have become paler in could and lighter in consistency. 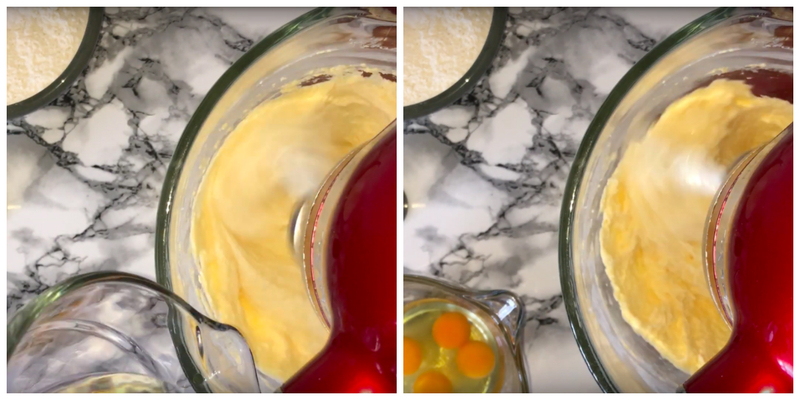 Once it’s become lighter in colour and consistency, give the bowl a quick scrape down (this helps to incorporate bits that haven’t been fully incorporated from earlier on) and then add your eggs and vanilla, one at a time beating well in-between each addition. If you try and add too many eggs in one go the mixture will scramble, so take care when adding the eggs. Once the eggs are fully incorporated, you’ll want to add in your dry ingredients, passing them through a sieve first so any large lumps are caught. Incorporate the dry ingredients on a low-medium speed until there is no trace in the main mixture (there might be a small amount that has worked it’s way up around the bowl, just incorporate it by using a silicon spatula). Add your milk/water in a teaspoon at a time. Divide the cake mixture between your prepared cake tins, I like to use digital weighing scales to get a much more accurate measurement but feel free to eye ball it (if you’re confident). Level it off as best you can using a small offset palette knife or the back of a spoon (whichever you have or works best for you). Place the tins in the preheated oven on the middle shelf and bake for 30-35 minutes (or until a tester comes out clean). While your cakes are baking, make your simple syrup which is super simple to make. Place the water, granulated sugar and vanilla into a saucepan and place over a medium-high heat and allow to come to a boil, then set aside until cool. Once the cakes are baked, allow them to cool in the tin for around 10-15 minutes and then transfer to a cooling rack and allow to cool completely before using. Once your cakes are cooled, whip your cream up, again this is easy and doesn’t take too long. Pour all of your cream into your mixing bowl of choice (if you have a stand mixer, it will come in handy at this point otherwise an electric hand whisk will work equally as well. If you’re doing this by hand, you’re braver than me…) and add in the icing sugar and vanilla and whisk together on a high speed until you notice some changes in consistency, it will start holding its shape. Stop whisking once you reach that stage as you can over-whip cream very easily and end up with a grainy whipped cream (which isn’t pleasing on the taste or appearance), so keep checking If you’re unsure. This batch of whipped cream will be the only batch you need. You’re best to whip the cream up just before you intend on using it this ensures freshness. 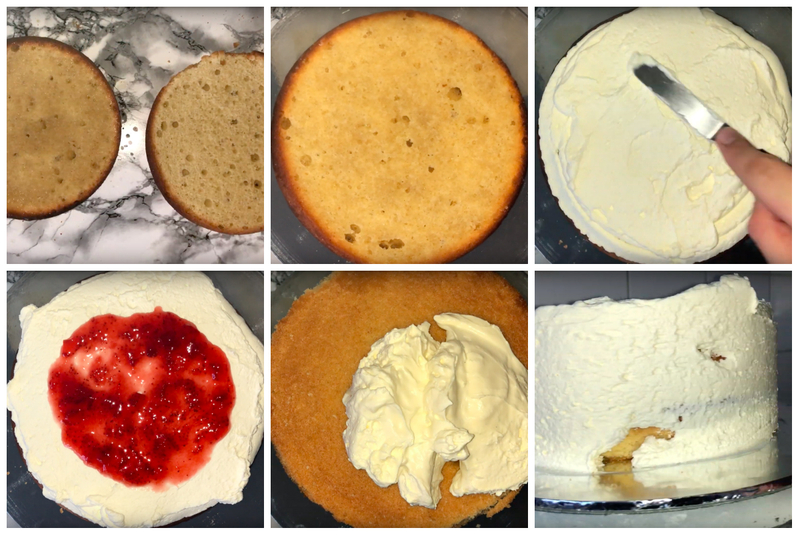 Once your cakes are cooled, level the tops off using a cake leveller and give each of the cakes a generous amount of the simple syrup, then you can fill the cake with a good amount of the whipped cream and strawberry jam, then place the second layer of cake on top and start to add the whipped cream onto the sides and top of the cake, giving a generous coating as this is the only coat that we will be needed. One the cake is coated with the cream, take your grated chocolate and add it to the side of your cake, I found using a scraper the best way to do it but feel free to wear gloves and pat on the chocolate – this is up to you. You should have some cream left over, place it into a piping bag with a nozzle of your choice and pipe it around the top edge of the cake, this helps to hide the edge of the chocolate that’s on the side and makes it look slightly better (in my opinion anyway), top the piped rosettes with chocolate or whatever you’d like to (fruit or nuts would work well here also). I had some remaining cream left over, so piped some shells around the bottom edge of the cake, this is optional but works well with the cake. 280g Butter, at room temperature. 6 Eggs, medium size at room temperature. 1 tsp Vanilla extract/bean paste. Grated chocolate (chopped nuts would also work as an alternative). Chocolate (or fruit would work well here also). Do some prep work by preheating your oven to 180˚c/350˚f, lining your 8-inch cake tins and weighing up all your ingredients. Place the butter and sugar into a mixing bowl of choice (I went ahead and used my stand mixer bowl) and beat them together until they are well combined and have become lighter and fluffier in colour and consistency. Once you’ve achieved the consistency, start adding your eggs, one at a time, beating well in between each addition. This is to prevent the mixture from curdling, if that happens, don’t worry too much towards the end of adding your eggs. Sift in about a 1/3 of your dry ingredients into the mixing bowl, then mix them in over a low-medium speed, then add in around a 1/3 of your milk/boiling water. Repeat with te remaining ingredients. Try not to overmix at this stage. Give your mixing bowl a good scraping down and divide the cake batter between your cake tins, you can do this by eye or measuring the amount of cake batter and halving it to get a much more accurate amount into each tin – this is best done with digital scales. Level and smooth off each cake as best you can with a small offset palette knife or the back of a spoon will work equally as well. Place your cakes in your preheated oven and bake for 30-35 minutes (or until a tester comes out clean when inserted). This is quick and easy to make; the only downside is the cooling time which takes the longest. Place the water, sugar and vanilla into a small or medium saucepan and place on the hob over a medium-high heat and allow to come to a boil, then remove from the heat and allow it to cool down to room temperature, or chill in the fridge if you don’t intend on using it straight away. Into your mixing bowl, place your 600ml of double cream along with the icing sugar and vanilla extract/bean paste. Whisk them together on a medium-high speed just until it starts to hold its own shape/stiff peaks. Over whisking the cream at this stage is easily done, if you do it will be grainy and look rough. Once it’s whipped, use it straight away or store in the fridge for up to 24 hours. Once your cakes are fully baked and cooled, level the cakes using a cake leveller or a knife and rule. You can then simple syrup the 2 layers of cake, ensuring they have received a generous amount of the simple syrup. Pipe or place a generous amount of the whipped cream onto 1 of the cake halves and then add a good amount of your choice jam (I went with strawberry). To finish the cake, sandwich the 2 layers of cake together and then coat the top and sides of the cake with the remaining whipped cream – use a generous amount at this stage. Any left-over whipped cream can be placed in to a piping bag (fitted with your choice of nozzle). Place your cake on to a upside-down bowl over a large baking tray or something similar and coat the sides with some grated chocolate. I used milk chocolate for this cake but feel free use white, milk or dark – whichever takes your fancy. I used a cake scraper to work the chocolate up the sides of the cake but if you’re confident you could do this by hand. Once the sides have been coated with the grated chocolate, take the piping bag with the remaining whipped cream in it and pipe rosettes around the edge of the cake – this helps to hide the imperfections and helps to make it look more professional. Top some or all of the rosettes with some chocolate or fresh fruit (or a mix of both will work well also). There is my recipe on how to make a fresh cream cake. It’s fully customisable to suit you and your occasion – I hope you enjoyed the recipe.